It is very possible that you have set the case shoulder back a bit when you resized them. Backed out primers are caused when the case grips the chamber walls during firing and never sets back to reseat the primer. Because Winchester and Remington cases tend to be softer (Remington more so) then other manufacturers they don't slip back as readily. .30-06 head spaces on the case shoulder. you will need to check to make sure you haven't set the die too deep. One way to adjust for this is to measure the highth of the protruding primer and divide in half. Set the die off the case holder by that much with a case in the die and holder. All you will need is a feeler gauge for this. Load the cases again and if the primers set back again. Repeat the procedure. Had this problem with my .30-30. 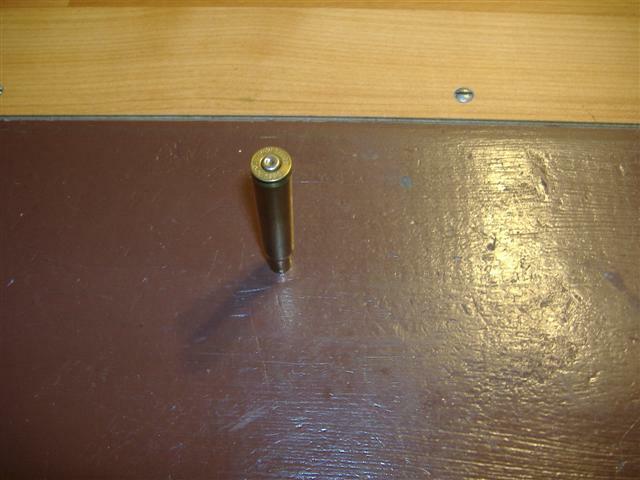 I had set the die .030" above the case holder. "..here's the question::: the primers ...are raised a little on the outside of where the firing pin strikes." You have some slight cratering. It can be a sign of over pressure or a weak firing pin but the most common cause is a loosely fitted firing pin in its hole through the bolt face. Try a slightly reduced load and see if it goes away. If it doesn't you likely have the poor fit. Try another brand of primer to see if a harder/thicker cap will fix it. I'm not sure but it seems the CCI primers currently have the stoutest cups for their primers. 1. Does it look like a ring in a puddle after a stone goes in? 2. are the outside corners of the primers sharp not round? 3. What is the dimension of the case just ahead of the web before and after firing? It sounds like wncc got you pegged. Kentucky...Can you furnish (post) a photo of the case? And does it look something like this? Yes I can see the flow around the firing pin. Not too bad but it is noticeable. CCI have a tad soft primer cups. Those primers wouldn't concern me at all. There is still a very nice curve on the outside radius of the primer which indicates pressure is very reasonable. The hole in the bolt the firing pin goes through in some guns is a little bigger than it needs to be and will cause cratering such as pictured above. KH...don't loose any sleep over askin' questions mate...that is how you learn. Better to learn from the experience of another than from your own mistakes. Remember mate...the only stupid question is the one you do not ask. I'm with both Gelan and Grumps on this one...there is no flattening of the primer whatsoever. The very slight cratering around the indentation is fairly common with almost any firearm. To my uncalibrated eye, there does not appear to be any significant pressure signs to worry about. Bushy does have a point though....and a nice "sharp" one at that. I can't see if KH's primers are "proud", soooo....if they are KH...try what Bushy has suggested. If they are not "proud", then I wouldn't loose any sleep over it... just keep an eye on things as you normally would. Yup Kentucky...Not to worry. It's as Grumulkin said. 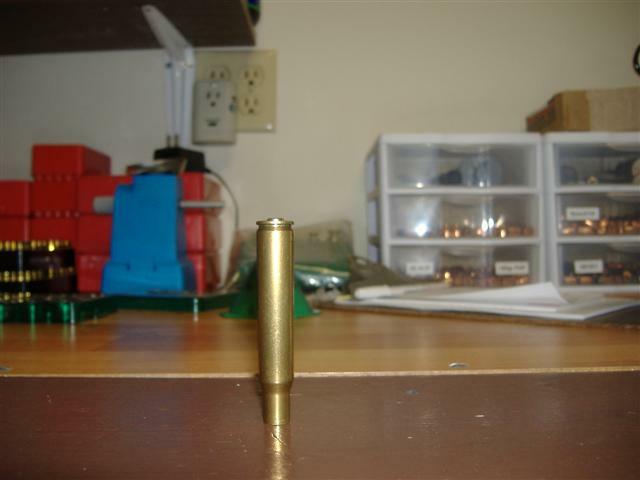 Just an over sized firing pin hole in the bolt face. Thank you, but a lot of the credit goes to the guys and gals on here. You may be right Bushy, but, somehow, I get the crater like hareraisers with CCI and no crater with Winchester, on my rifle loads. On Pistol loads, yeah, your list agrees with mine, CCI is hardest winchester then remington then federal is softest.